Today the Church celebrates the Feast of the Holy Family. Each of the readings provides a reflection on how family life is lived so as to lead us into ‘holiness’. The Book of Wisdom – or Sirach – arrives at a reflection on the commandment to Honor one’s Parents. Implied is a respectful relationship between Parents and children. The covenant relationship with God is mirrored in relationship to Parents. This relationship is lived through prayer and obedience, forgiveness and justice. Consider the ups and downs Mum and Dad have been through in raising your family. How do you currently show and practice ‘thankfulness’? As Parents grow old, ‘the mind fails’ what do you do that may ‘grieve them’? How do you show ‘kindness’? Family life has struggles and difficulties. The Community of Colossae that Paul is writing to is struggling greatly with Jewish christians welcoming ‘Gentiles’ – (Greeks) into the Christian community ‘family’. St Paul writes about the ‘Family Code’ also called the ‘Holiness Code’. We are all called to ‘put on’ the white garment of baptism and the new life of Jesus that we live. In the Church (or your Family), who is included or excluded? Which attitude do you recognise could be practiced more by you in your ‘family’. How could you allow ‘peace’ to control your hearts? Subordinate (“under”) reflects the customs of the early Roman times. Christians were keen to live by the ‘family code’ to show Roman authorities that they were not dangerous to government. Is order in family life healthy? What ‘order’ do you have in the family? Home? How is ‘bitterness’ resolved? What arguments arise over children’s behaviour and obedience? What attitudes or behaviours ‘provoke’ and ‘discourage’ your children? Does the Word of God dwell richly in your home? Is there any singing and praying and showing gratitude to God? Joseph is revealed as a man who faithfully responds four times to a message from an angel. 1st to take Mary – pregnant – home to be his wife. 2nd to become a refugee and take his wife and newborn baby into a foreign land (Egypt). 3rd to return to Israel with an uncertain political leader and future. 4th responding to a warning about where to live. Imagine yourself in each of these 4 examples. What do you learn about Joseph? What would Mary’s experience have been at each of these moments? 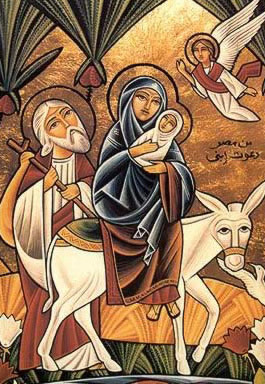 What does this teach you about the ‘Holy Family’? How obedient are you in prayer when you notice an inspiration and desire from God? Epiphany is the Greek word meaning to ‘show’ or ‘make manifest’. The Magi from the East- coming from the Greek word for people of special knowledge – paying homage to Jesus symbolises all nations recognising Jesus as King and Lord. If you had to write a story to teach the truth about Jesus what truths would you seek to include? How should the Church make Christ known more today? What is the most creative christian evangelisation message you have seen lately? Isaiah makes a beautiful prophecy which is fulfilled in the Gospel of Matthew story and the Magi today. God’s chosen people have just returned from exile and their country and beautiful city of Jerusalem and its Temple are in ruins. Isaiah begins with the image of Jerusalem as a woman lying down in defeat. ‘Rise up Jerusalem! Your light has come.’ As we enter the beginning of the New Year how could you help the Church ‘rise up’ and make Christ known? What would it take for you to be radiant and your heart throb with joy and pride in the Church community? What will you do? Paul states very clearly a mind-shattering truth: ‘the gentiles are coheirs’. Jewish people thought of and treated ‘gentiles’ as ‘unclean’. Paul says they are ‘clean’ and co-partners in the inheritance of God’s promises and family. What adjustments in mind and heart and action would take place if God revealed to you that everyone was clean and equal and a ‘brother’ or ‘sister’ to you and you were all part of the same family? Imagine what life-style this would involve. Are you willing to try? Can you glimpse this is the central gospel message of Jesus? In ancient times a new star was thought to indicate a new leader being born. The Magi are on a journey of seeking God. They have knowledge. Resources. Time. All that the world declares is necessary. Yet they are hungry for something more. What is currently guiding your life? Would you say you are thirsty, hungry, searching? How and where do you find Jesus today? The three gifts presented reveal the identity of Jesus. Gold for a king. Frankincense for a priest whose role is to pray and send prayers to God in heaven. Myrrh pointing toward Jesus’ sacrifice and death and future burial. As the new year begins what personal ‘gifts’, talents, are you willing to ‘give’ in service to God? Consider the deeper meaning of homage and surrender. How could you express a deeper commitment to following Jesus? What change of direction would you like to make to imitate the Magi? 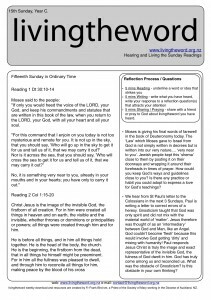 Reflection Question 2: The Isaiah reading today is the first of four ‘suffering servant’ passages. They point to the mission of Jesus and to our personal mission and identity given in Baptism. Can you identify with the cause of making justice victorious? Being a ‘sign’ and ‘covenant’ of the relationship that God has with the world? Does your life truly show itself as a ‘light’ for all to see? Do your words and actions bring a transformation into people’s lives who live in darkness of ignorance and lack of love, imprisoned and hurt by life? Do you identify with this personal mission and the mission of the Church?